Having realised that the origin of ‘Text’ comes from the Latin ‘textere’ meaning ‘to weave’, Kim Disley has taken to translating written texts into visual embroideries and patterns and her current work takes inspiration from the Celtic Tales and Myths from ‘The Mabinogi’. 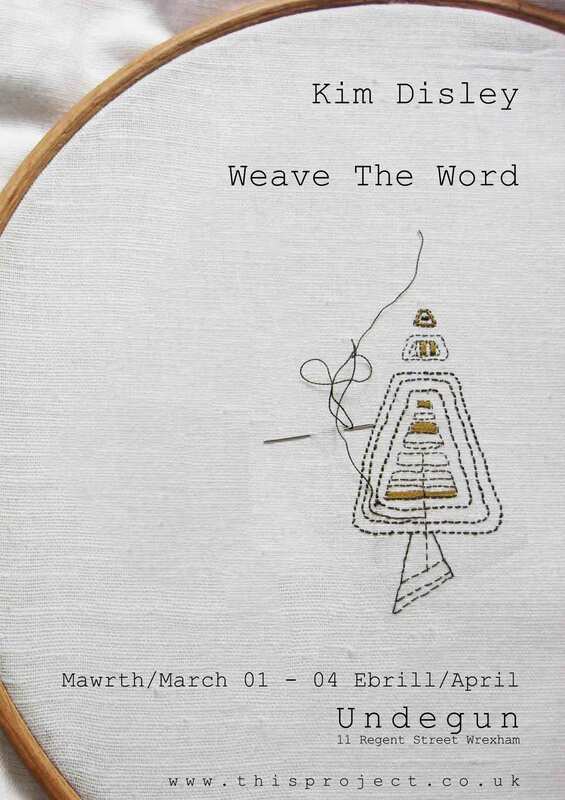 Some of these embroideries will be exhibited at Undegun from March 1st until April 4th. Repetition is also extremely important, the same image is used constantly; by altering it with different colour combinations or by mirror imaging, many different designs appear. The repeated image in rows and columns has a correctness and precision. Kim Disley is ultimately influenced by the clean, straight lines and classic timelessness of the Bauhaus; this simplicity is a template on which most designs are based. Lino cuts by Cyril E. Powers and Sybil Andrews from the early 20th Century, which have the simple repetition and orderliness, are also an influence.